Really cool looking speaker but please, don’t use those protection boards for charging! They do work fine for discharge / undervoltage protection but fail at charging the cells properly. If you connect a power supply, it will charge the cells but only until one cell of the 3 reaches it’s limit. Also, it doesn’t to CC/CV charging but just connects the PSU to the pack! In case you really need to build a 3S pack, get an external 12,6V LiPo charger that does CC/CV charging. I recently went through the same problems in finding a 3S BMS that does charging correctly and could not find anything. So in case I’m wrong, please correct me. I’m still searching! I’m also on the same hunt. They all say “balancing” and it is always a filthy lie. Anyone got any leads on real charging bms boards? I can only find them for lifepo4. Yeah, it’s one of those things where we can’t really tell how it sounds for sure. But given how much work/thought went into it, I’m sure he wouldn’t have stopped refining the design unless he was satisfied with it. Some serious time and planning put into that, looks very good! Nice video, but the product has too much dependence on glue for my taste. Covered in light fabric it will get dirty if handled (it’s portable not desk bound), oh it has a convenient thumb grip right in the middle. Our ears are separated by more than the spacing of those “stereo” speakers. One big speaker in mono will sound better in a box resonating in the bass range than boxes of less than one octave range coffee cup sound effects. Ditch blurtooth. 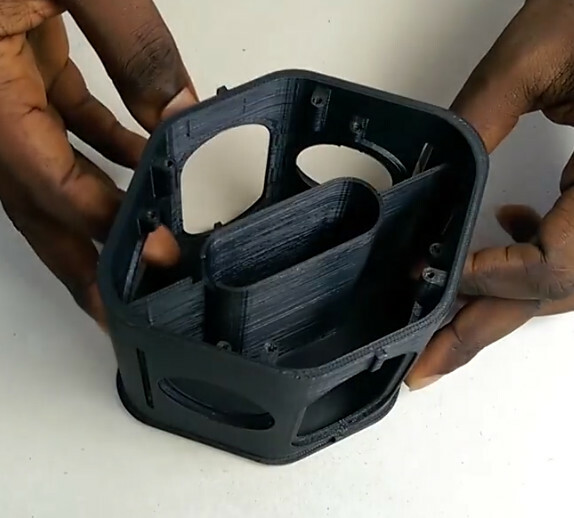 With 3D printing you could come up with multiple serpentine duct resonating functions with a single bass speaker in a bread box sized device and it would look really cool. Well it’s your idea and that was his Idea we can see the results of his Idea. That’s a really design! I love that he spent time talking about how to trim down components if you want to cut costs. It’s just a shame that he didn’t sand the edges before gluing it together, I don’t think you would be able to tell it was home made if he had!